The Minnesota Lynx are finally playing like, well, the Minnesota Lynx. Minnesota has put together a five-game win streak after a 3-6 start during which the Lynx looked nothing like that team that had won four WNBA titles since 2011. Next up for the Lynx are the Atlanta Dream on Friday night at the Target Center in Minneapolis. The Lynx (8-6) are coming off an 88-73 win over Las Vegas on Tuesday. 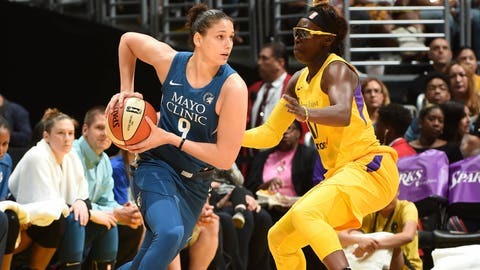 Minnesota, during its streak, has beaten Phoenix to end the Mercury’s run of eight wins in a row and handed the 10-4 Seattle Storm its only loss in the past five games. The Minnesota veterans have stepped up during the run. Lynx stars Maya Moore and Sylvia Fowles, the league’s reigning MVP, have silenced the voices of those who wondered if this team was too old. Moore erupted for a season-high 32 points in Minnesota’s 91-79 win over the Storm on Tuesday at Target Center. Fowles added 28 and 17 rebounds for her 11th double-double of 2018, tops in the league. Atlanta (7-7) enters Friday’s contest, the second of three straight road games for the Dream, off a 93-80 loss at Chicago despite 19 points from former Minnesota point guard Renee Montgomery. This will be the second meeting this season between the two teams. The Dream ended a nine-game losing streak against Minnesota with a 76-74 win in Atlanta on May 29. The Dream might be a little road-weary. Atlanta’s matchup on Sunday with the Fever in Indiana will be its eighth road contest in 10 games. The Dream will have traveled more than 9,200 miles during that stretch.